In January of this year, there was a fire in the attic of the Courthouse. Black smoke and tiny bits of burning plastic flooded in to the mural room. The plastic embedded itself into parts of the paint and the smoke put a brown finish over the whole mural. 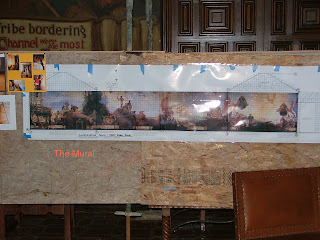 To make things worse, the mural was never finished with a final varnish coat to seal the paints back in the 30's.!!!! ...............divided into 4 sections =4 walls. 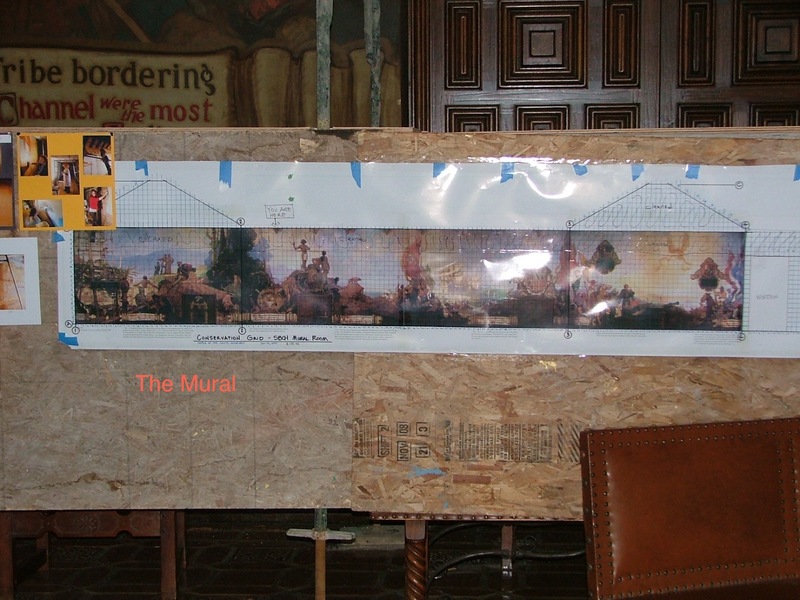 and multiple workers to clean, restore and stabilize the mural!!! It is rare that one would ever get a chance to see restoration work done on this scale. It is like magic. They put a solution on the mural and then carefully blot off the smoke. It can go from a cloudy looking day to bright sunlight in a few blots! !